Pericles, oh Pericles, why oh why did you lead us to this point, oh Pericles? Pericles is said to have been the guiding force behind the greatness of Athens and its empire. According to Thucydides, he was also the person most responsible for the Peloponnesian War in Athens. Conversely, had the Athenians followed his advice and played their cards cautiously during the war, they could really not be beaten. As an example, see the Athenian expedition to Sicily. Even suffering the effects of a plague that twice rampaged through Athens, and also killing Pericles, the Athenians were still doing well in the war. The game is a bit unusual in that it can be played as a four, three, or two player, but also has rules to play it solo. This is a great mechanic that means the game can be played for game night or when you cannot find anyone. I think more games should have this many options. 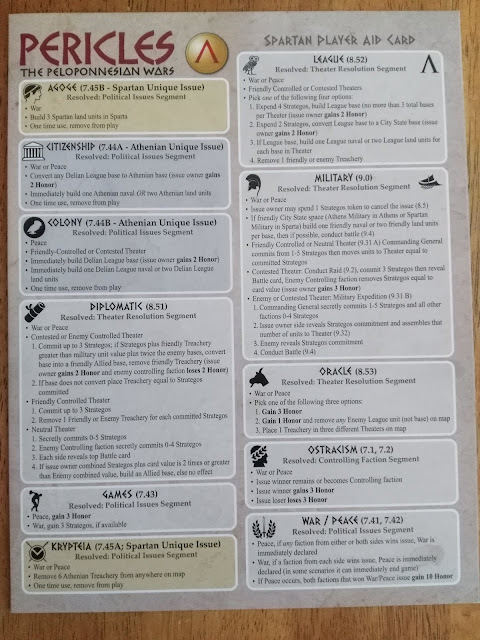 Scenarios, Solitaire and two, three, or four player rules, a full thirteen pages of play examples, five pages of 'Card Personalities' (this is a short bio of important people in the game), Strategy guide, and finally Designer Notes. The game is played in six year turns. 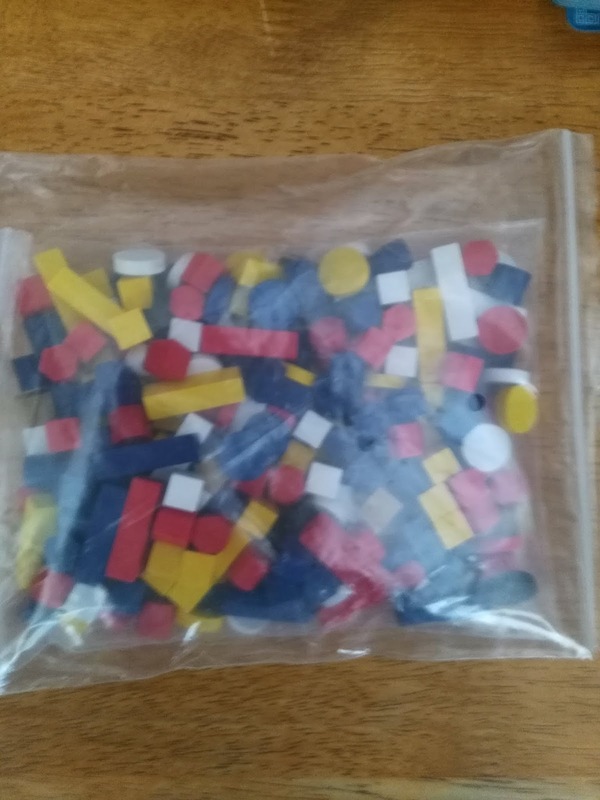 The game is interesting because it includes the issue of each side's 'Assemblies'. You are not put in the position of a ruler or omnipotent eye in the sky. This part of the game really shines. The political infighting in the different cities was almost as intense as the actual warfare between them. There are twenty-three historical scenarios to choose from. These run the gamut of small one turn scenarios to 'The Suicide of Greece 460-400 BC' one. Just as in the actual history of the war, there is a chance for plagues to affect play. Alcibiades (the man who helped defend Socrates at the Battle of Delium) even gets his own wooden counter. 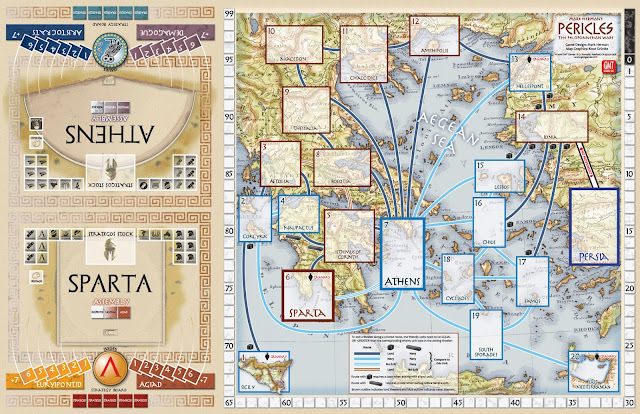 What more could you ask for in a game about ancient Greece? If I made the game out to seem too complex, in truth it really isn't. All of the books and aids pretty much hold your hand while getting your feet wet in this great game. It seems like an overwhelming mouthful at first, but like many great boardgames the more you put into it, the more you will get out of it. The game is one of the very few on BGG that has a rating of over 8 (8.10 to be exact), and also has a good number of voters. The game is that good and deserves every decimal point. I will admit to have not had the pleasure to play it in four player mode, but solo and two player are also great gaming fare. The amount of background of history and actual personalities stuffed into the box is an Ancient Greek geek's dream. You should be able to get a credit or two for college for playing the game. Certainly there have been some corners cut in the mechanics of the game compared to real life, but after all it is meant to be a game to be enjoyed. The game plays out, if you use the correct strategy, as the war did. Sparta is the heavyweight on land, and Athens is the heavyweight at sea. It is almost like two fighters, one in an earthen ring and one in a pool beside it. 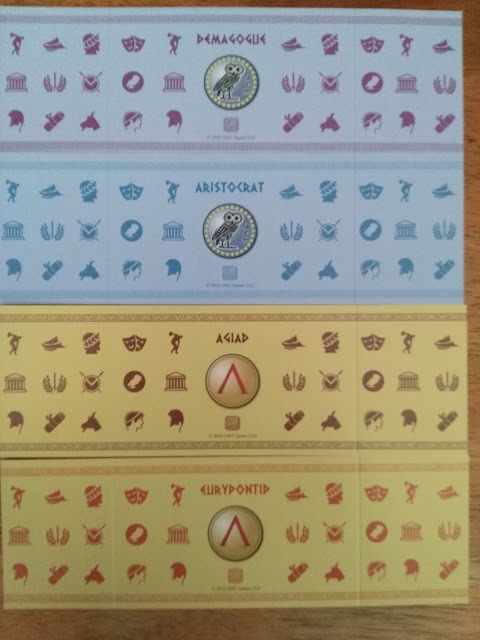 Athens must harass and disturb Sparta by raiding. Sparta desperately wants to come to grips with its enemy. The only way they can is through their different surrogates. Each city of Ancient Greece is up for grabs in this melee. Athens is a super power with an Achilles heel: its citizens' stomachs. Athens cannot feed itself without imports. Sparta has two problems of its own. The first is 'Helots'. These slaves are always on the verge of rebellion. The second is that there are only so many actual Spartans. 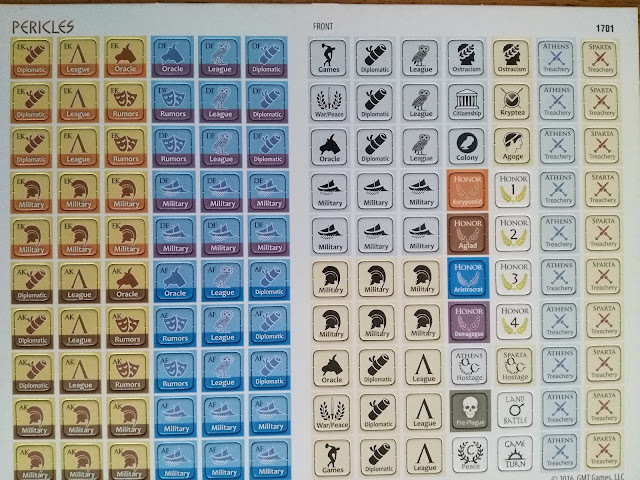 Their killing off of their own and the extremely hard process to adulthood in Sparta meant that there were never enough full citizen male Spartans. 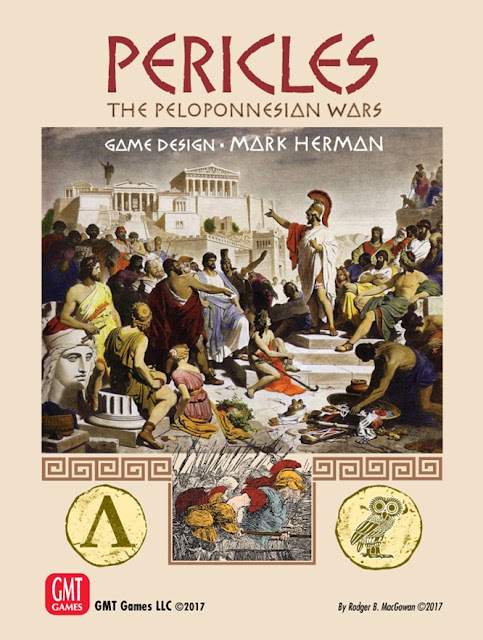 Pericles hits the sweet spot between a wargame and a political game. It also represents the fight for honor that the leading citizens of both sides felt was so imperative. It somewhat resembles the race through the Cursus Honorum of the Roman Republic except that it was much less regulated in the Greek city states. Totally wiping out your opposition, be they demagogues or aristocrats, happened much more frequently in Greece than in Rome. For all our love of the Greek civilization and what it brought us, it was a rough place. Phormio is the name of the bot or AI that you play against in solo games. Some people have suggested that playing solo is really just a way to learn the mechanics in parts of the game. Others have had an enjoyable time playing solo and still do. While I agree it is a good way to learn the game, it will still give you a run for your money. The design along with all of the components are all top notch. It looks like I will have to pick up the game 'Churchill' soon. 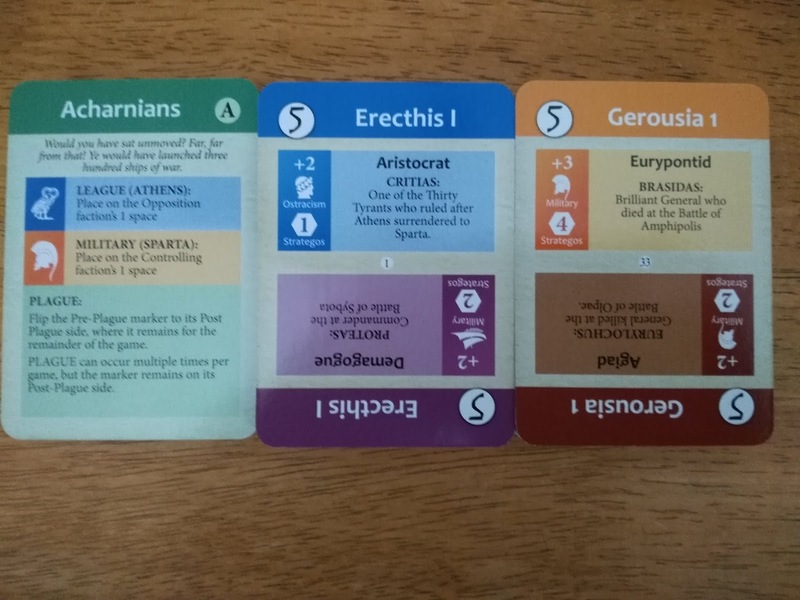 My hat, or pileus, is off to the designer and GMT games for this excellent portrayal of this period in history. The games I have played have pretty much all come down to the wire. So much can happen that, just like in Chess or any good wargame, you always have to have a plan B,C, or D ready to put into play. I must thank the designer for another bit of gaming greatness. 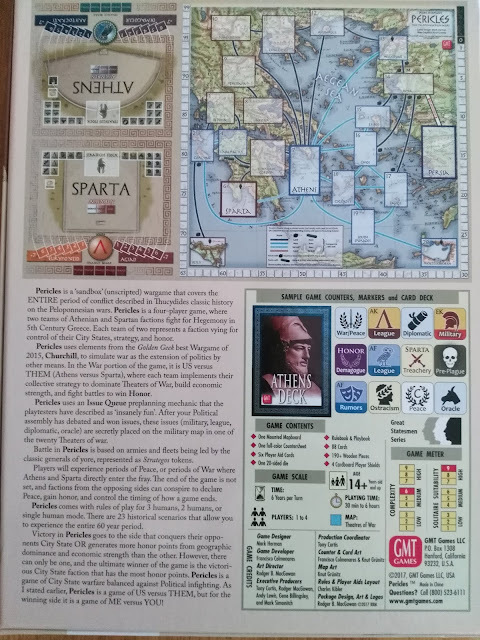 It seems (among many others) he was involved with designing 'The Art Of Siege', my favorite wargame of all. So if you have any interest in the age at all, or just want to play a cutthroat wargame, pick this game up. For anyone who is having trouble with the rules or just wants to play well, Mr. Herman has posted some excellent Youtube videos on the game. The only problem I have seen mentioned with the game is to find people who have enough time and commitment to learn and play it. Of course, that is where the alternate number of player rules comes in.